DC are celebrating the 100th birthday of comics legend Jack Kirby this year by having some of their top creators compete in the Kamandi Challenge. Each issue sees a different writer/art team work on one chapter in the life of Kirby creation Kamandi, the last boy on earth, ending their issue on a cliffhanger that must be solved by the next creative team. It’s been patchy so far, maintaining a sense of fun overall that pays homage to Kirby nicely but rarely offering anything that memorable. That all changes with this phenomenal fifth issue, written by Fables scribe Bill Willingham with art by Ivan Reis – a genuinely top tier creative team. 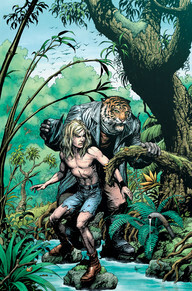 Willingham ups the stakes for Kamandi almost immediately in this quick moving adventure that feels more packed with development than all the issues prior to this one combined. We meet pirate dogs (literal dogs – Kamandi is a boy surrounded by anthropomorphic animals at all times), lemur mad scientists and a Sherlock Holmes-esque lion detective who almost steals the show – were it not for an incredible, genuinely shocking cliffhanger at the end. I don’t envy the next creative team who have to get Kamandi out of this one. Provided they do, and the Kamandi Challenge finishes as planned at the end of the year, fingers crossed we get more Kamandi adventures from Willingham and Reis, because this was fantastic.